A wireless microphone is visually appealing, produces crystal clear voice and there is no risk of tripping when you turn on the heat with your music or speech. There is an air of professionalism when you use a wireless microphone. You can move more freely and interact with your audience. If you are not well versed with the technology used in wireless microphones, the process of choosing the best wireless microphone can be daunting. By paying attention to a few basics you can be the proud owner of your own wireless microphone. Sennheiser has been a pioneer in this field and even today continues to manufacture pieces that find several practical applications in stage production and music world. For a convincing and power packed performance on stage Sennheiser microphones are a must. Here are three of the best wireless microphones manufactured by Sennheiser. Each of these pieces are similar and yet so different. The table below will guide you in choosing a system that is ideal for your need. But before that you should know what a wireless microphone system is. A wireless transmitter: It sends signal back to the Microphone. A wireless receiver: Its job is to process signals that come from the handheld microphone and convert them into electrical signals. Make sure that there is no object which is blocking the view of the transmitter and the receiver. They must be in a straight line to prevent loss of signal. An active antenna will ensure that the signal is not lost and also will improve and maintain the quality of reception of the signal. Handheld microphones need batteries. Hence always keep batteries full charged. All of Sennheiser microphones use XLR-3 connectors minimizing external intereference. 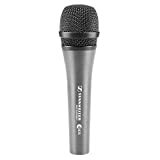 If you are a musician, a vocalist in fact then then Sennheiser e935 Cardioid Dynamic Handheld Mic can be called the best microphone for you. This Dynamic microphone doesn’t pick up the ambient sound from around the microphone thereby giving the vocalist a chance to work the mike to his/her advantage. The microphone is rugged, durable and can withstand shocks and falls. Its excellent feedback rejection makes it ideal for live stage shows and concerts. It can be used for recording electric and acoustic guitar, bass guitar and all other musical instruments including drums. In fact, drums sound absolutely smashing when recorded on this Sennheiser. Low handling noise and high feedback rejection are trademark of all Sennheiser microphones and the Sennheiser E835 is no different. SPL handling ability: the E835 is designed to handle SPL of over 150 dB thereby be it the drums or the bass, the e835 can handle it. The Cardioid pattern ensures that ambient noise is cancelled. Low Handling Noise: The internal shockmount ensures that the capsule is protected from high volumes. Uniform pickup: Live stage shows have no controls and hence to produce a performance that is top notch you need the help of a cooperative microphone. The e835 makes sure that irrespective of the position of the mic the tone and is maintained and you are able to perform with abandon. 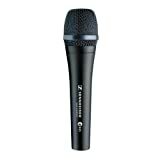 We can safely call the Sennheiser e835 a mic for the stage at a price that doesn’t break your bank. For that dynamic on stage performance sport the Sennheiser e935 handheld microphone and perform like there is no tomorrow. 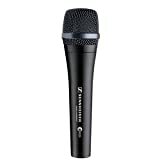 Is ruggedly built with a shock mounted capsule that ensures that the noise around on the stage does not spoil your show. The Cardioid makes sure that just your voice, clear and clean, is audible while the rest of the handling noise on the stage does not reach the audience. With the e935 you can be assured that for years together you can give stage performances that rock. It is one of the best wireless microphones in the market currently. Its construction, quality and price are all noteworthy. This microphone is ideal for the professionals who believe in not compromising in quality. The e900 series especially has been designed to produce natural sound that is clean, clear, rich in detail and dynamic. These high end microphones have a superior feedback rejection and come with an unbeatable 10 year warranty. Buy some awesome Mic for Vocal from the TOP 5 LIST!